As we age, our skin care needs change over time as well. We may not need as harsh ingredients to deal with acne or scarring, and our priorities shift to wrinkle prevention or a way to treat sagging. This is true of both face and body, and some new routines, along with specialized products can help with all of these needs. The most important thing you’ll need to address these skin issues is lotion, as regular use can prevent wrinkles, sagging, and help keep a youthful tone and texture overall (when used with a proper cleanser, of course). Read on to find some especially beneficial ingredients, the best lotions out there, and some extra elderly skin care tips. Hyaluronic acid is a must-have ingredient for elderly skin. This is the chemical that our body naturally produces when we’re younger that prevents wrinkles and sagging of the skin. Our body produces this less as we get older, so supplementing that loss by applying the ingredient topically in our lotions will help maintain skin health. Also look for glycerin and dimethicone. These are effective humectants or ingredients that hold and retain moisture in the skin. They basically retain the water you already have in your skin, and hold the effective moisturizing ingredients in the lotions in place long after they’re applied. In terms of those moisturizing ingredients, natural oils and butters will be the most gentle and effective for elderly skin. Mineral oil, jojoba oil, cocoa or shea butters are the best ingredients to look for in lotions. 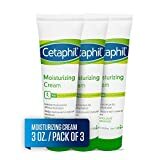 Cetaphil is a decades-old household name known for gentle, quality skincare. Their moisturizing, fragrance-free lotion/cream is perfect for any elderly person looking for a little extra bodily hydration. It’s made for dry, sensitive skin, and it’s even safe on eczema-prone skin. Clinically proven to provide immediate relief of dry skin, it offers long lasting hydration and smoothness. It’s often recommended by dermatologists for elderly skin because of this. You’ll also notice it’s not greasy and absorbs quickly, so you don’t feel like you’re wearing a layer of lotion. 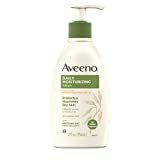 Another clinically tested and often recommended lotion for elderly skin is from Aveeno. Aveeno is known for natural, organic, gentle ingredients that soothe dry skin and prevent wrinkles and sagging. This particular lotion is beneficial because it provides broad spectrum UVA/UVB ray sun protection as well, which is incredibly important for preserving elderly skin. It also has the natural soothing, moisturizing ingredient of oatmeal mixed in. Dermatologists recommend oatmeal as a nourishing ingredient because it can bring skin’s pH back into balance and help maintain skin’s barrier, preventing moisture from leaving the skin. This lotion is non-greasy and absorbs quickly, and there’s no added fragrance. You’ll want to stay away from added fragrances entirely, because they can cause a lot of irritation. This organic cream is good for use on your body, face, or as a spot treatment. What makes this lotion unique is its antioxidant infusion of vitamin C, which is proven to stimulate collagen production and reduce fine lines and wrinkles. It also has many other nourishing natural ingredients like shea butter, jojoba oil, and avocado. All of these help prevent free-radicals and improve your skin’s elasticity and strength when used consistently over time. If you love natural skincare ingredients, this is a great choice. ANTI-AGING - Our nutrient rich cream stimulates collagen production to reduce fine lines & wrinkles. GLOWING COMPLEXION - Formula hydrates, firms, & evens skin tone to rejuvenate & revitalize your skin. ECO-FRIENDLY - Biodegradable; Non-Toxic; Non GMO - We never use pesticides, chemicals, or fertilizers. LOCAL - Handmade in the USA with sustainably sourced, gluten-free ingredients; all of our product is cruelty-free. 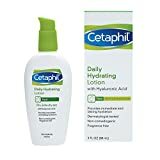 Speaking of facial moisturizers, one effective lotion specifically designed with elderly skin in mind also comes from Cetaphil. This lotion has that all-important hyaluronic acid to plump up the skin. It also has strong humectants for long-lasting hydration, but its lightweight gel formula is gentle and light enough to use under makeup! It’s also oil-free, and so light that it’s certified to be non-comedogenic, meaning it will not clog your pores. It’s fragrance free as well, which is a major benefit if you have sensitive skin. Finally, Advanced Clinicals makes another great, super hydrating face lotion for the elderly. The active ingredient here is collagen, which improves elasticity and eliminates the appearance of fine lines and wrinkles. Collagen is also so plumping to skin that it prevents sagging as well. It’s paraben free and includes natural ingredients like green tea for antioxidants, as well as aloe vera and chamomile for their calming properties. This formula is made for your face, but you can use it on your body too. What I particularly like about this lotion is also the bottle, with an easy, no mess, easy to use pump. FOR SALON PROFESSIONALS - HUGE 16oz JAR WITH EASY TO USE PUMP that will last you months. Images, Ratings, & Prices from Amazon Product Advertising API - Updated on 2019-04-22 at 17:37 - contains affiliate links (see footer). Try not to spend too much time in the shower or bath. The hot water can dry out your skin very quickly, leading to further wrinkles, cracks, cuts, or the like. Cutting down on this time also saves water, helping the environment and your water bill as well! Also, make sure to thoroughly massage the lotion into your skin the correct way. On your body, gentle, mid-size circular motions in both clockwise and counterclockwise directions will allow the lotion to fully absorb into the skin, and this motion will also stimulate blood-flow to all areas of the skin, improving the overall tone and elasticity of the skin. And, don’t forget the feet! For more blood-flow encouragement, try dry brushing before every shower. This just involves taking a gentle body brush and running it all over your body. This routine gets rid of dead or dry skin cells, It also enhances skin’s tone and texture by bringing more stimulation and blood-flow to through the body up to the skin layers. It prevents cellulite and encourages more elasticity as well over time. For your face, make sure to use a gentle cleanser before you moisturize, and as you’re applying your moisturizer use the same circular clockwise and counterclockwise motion as you did on your body, only in smaller circles. Once the moisturizer is applied all over your face and neck, give that skin area a nice massage in upward motions to discourage any sagging or wrinkles. Skincare routines need to change with us as we age. Luckily, there isn’t too much of a difference, and the overall process can be much more luxurious anyway! Look for a lotion with the specific ingredients above and make sure you’re applying them correctly. I think Aveeno or Cetaphil are the best options, personally, as they’re incredibly gentle, but just as effective. Lotions like this also make a great gift for seniors! What’s your favorite lotion or new skincare routine? Share below.